Heat oven to 350°F. Spray 16 regular-size muffin cups with cooking spray. Separate biscuit dough into 8 biscuits. Carefully separate each biscuit into 2 thin rounds to make 16 total rounds. Firmly press 1 biscuit round in bottom and up side of each muffin cup, forming 1/4-inch rim. In medium bowl, stir sliced hot dogs, 2 tablespoons yellow mustard and the Worcestershire sauce. Spoon mixture evenly into biscuit cups. Beat egg with 1 tablespoon water; brush mixture on edges of biscuit cups. 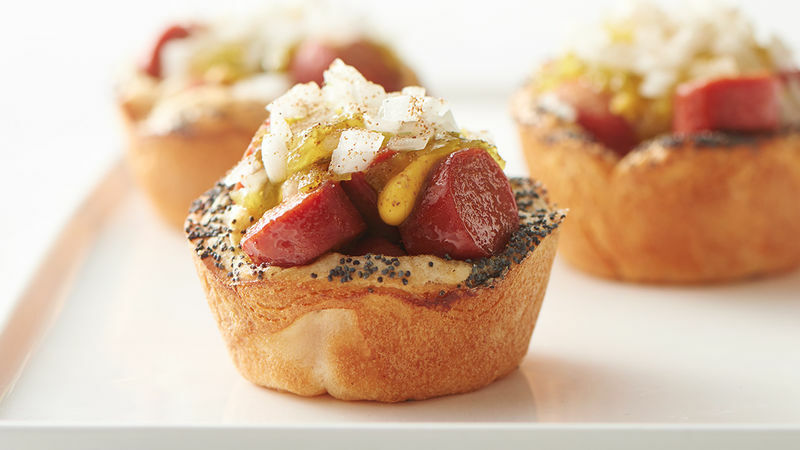 Sprinkle poppy seed evenly on edges of biscuit cups. Bake 18 to 20 minutes or until edges of biscuit cups are golden brown. Transfer biscuit cups to serving plate. Top each with 1/2 teaspoon yellow mustard, 1 tablespoon relish and 1 tablespoon white onion. Sprinkle cups evenly with celery salt. Ketchup is notoriously not an ingredient in Chicago-style hot dogs, but feel free to “cheat” and dip these cups into ketchup, if desired. Cups are best served right out of the oven while still warm.